Food delivery apps have been (not so) subtly competing with each other in the Indian market for the last five years or so. Ever since Swiggy entered the market and Zomato started delivery, it’s been competition central between them resulting in happy foodies all over the country. Some other players in the market are FoodPanda and JustEat and of course, UberEats - the new kid on the block. In the last couple of months Zomato, Swiggy and UberEats have all launched aggressive marketing campaigns with UberEats partnering with Alia Bhatt (starpower), Zomato organizing “Zomaland” and Swiggy launching a series of marketing campaigns such as “Swiggy Delights” and their new TVC about enjoying every precious moment in life. Talkwalker, a social media analytics company, based in Luxembourg, takes a closer look at the buzz, using their platform. 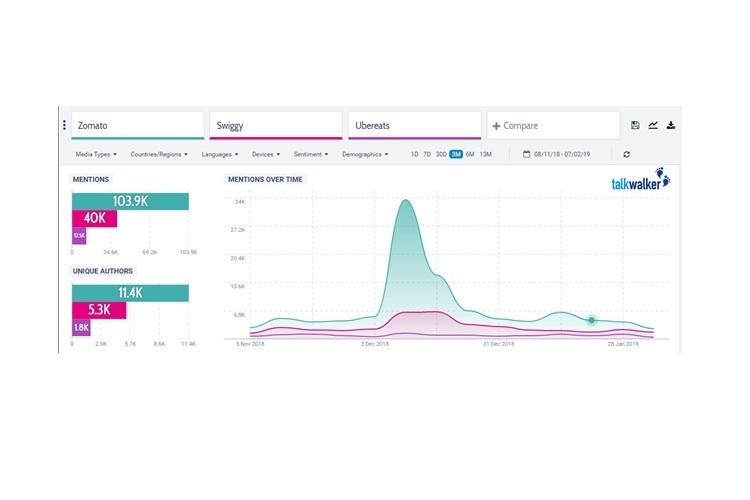 Talkwalker Analytics analyzes the performance of mentions all over the internet and provides key metrics such as engagement, related themes, influencer data and media share. Mentions: In terms of pure mentions Zomato leads the pack with ~104k, followed by Swiggy with 40k which is over three times the number as UberEats (12.5k) over the last 3 months. This is normal, considering that they’ve been around for far longer. Additionally, Zomato’s peak is not necessarily positive and had to do more with the fact that people caught delivery personnel eating packed food on camera. Swiggy had a slight advantage over UberEats because one of their delivery personnel selflessly saved the lives of over 10 people when a hospital in Mumbai caught fire last December - the peak in the image corresponds to that. But post that, this year we see UberEats slowly catching up with Swiggy especially after their ad campaign with Alia Bhatt. Emojis: What’s the first thing that comes to mind after you’ve ordered food? Emotions. And food delivery is no exception to this. 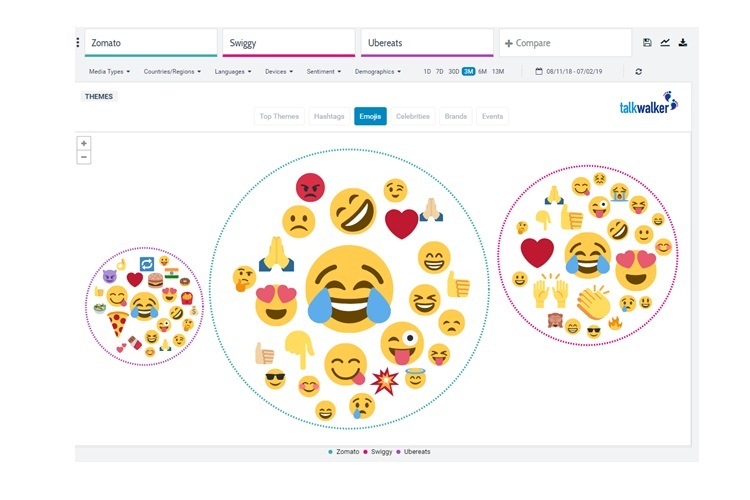 Our emoji cloud shows you the most used emojis in relation to all three services.Though Zomato and Swiggy have more mentions, it’s interesting to see actual food emojis for UberEats - some of these are pizza, burgers, salad, fries, doughnuts and chocolates. This gives us useful insights into the kind of food that has been ordered on the platform. The most prominent emoji for all however is the “crying with laughter” emoji. No surprises there!